(Nanowerk News) Scrolls thousands of years old provide us with a glimpse into long-forgotten cultures and the knowledge of our ancestors. In this digital era, in contrast, a large part of our knowledge is located on servers and hard drives. It will be a challenge for this data to survive 50 years, let alone thousands of years. Researchers are therefore searching for new ways to store large volumes of data over the long term. Particular attention is being paid to a storage medium found in nature: the genetic material DNA. DNA lends itself to this task as it can store large amounts of information in a compact manner. Unfortunately, the data is not always retrievable error-free: gaps and false information in the encoded data arise through chemical degradation and mistakes in DNA sequencing. 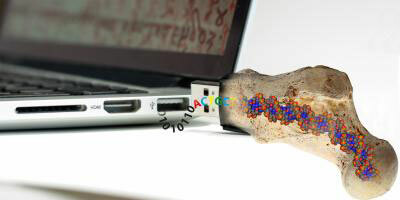 Now researchers led by Robert Grass, a lecturer at ETH Zurich's Department of Chemistry and Applied Biosciences, have revealed how the long-term, error-free storage of information can be achieved, potentially for more than a million years ("Robust Chemical Preservation of Digital Information on DNA in Silica with Error-Correcting Codes"). First, they encapsulate the information-bearing segments of DNA in silica (glass) and second, they use an algorithm in order to correct mistakes in the data.